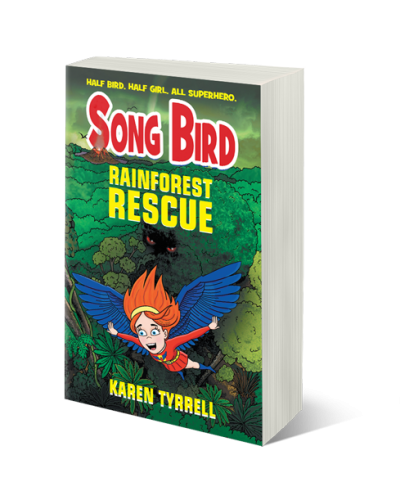 I’m presenting my eco warrior junior novel, Rainforest Rescue (Song Bird 3) on school visits. 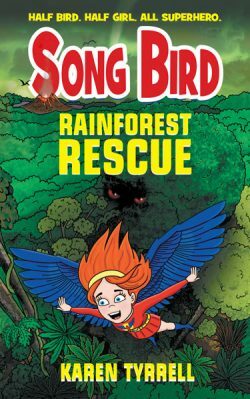 What does Rainforest Rescue teach children? 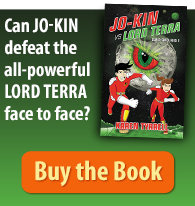 Inspires kids to care for trees, rainforests, National Parks and the environment. Educates kids on aboriginal mythical creatures, bush tucker and World Heritage Gondwana Rainforests both ancient and present. Empowers kids to connect with their inner superhero to work as a team to care for the environment. August is Book Week month! Thanks to schools for booking me for a school visit. I’m presenting author talks to primary schools, colleges and special schools for my 9 children’s books. 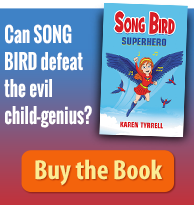 My formats include pantomime with costumes, power point talks, writing workshops and interactive dramatic readings from the Song Bird Series. How do I Present Rainforest Rescue School Visits? Tips on how children can care for trees, rainforests and National Parks. 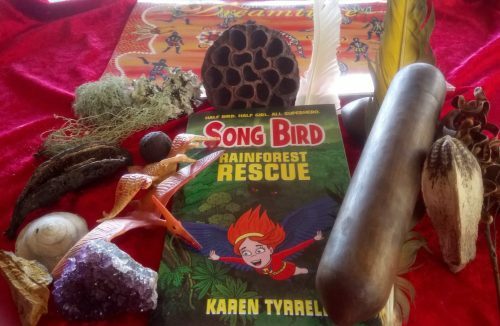 Show & Tell my rainforest treasure including fossils, aboriginal clap sticks, crystals, lichen, pods, seeds, ferns and bush tucker from the rainforest. 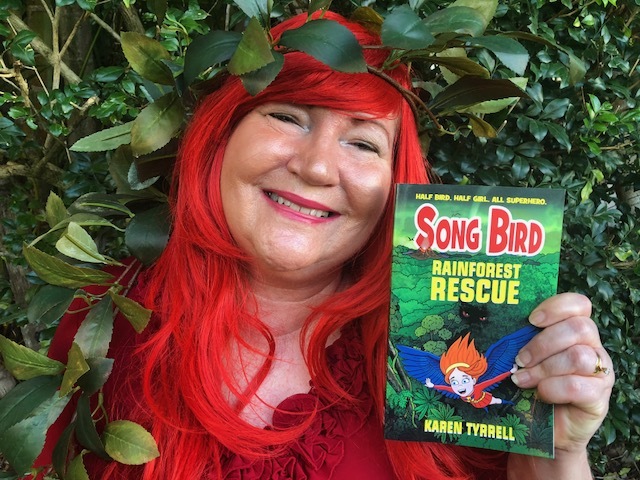 Author talk with costumes, props, interactive dramatic readings from Rainforest Rescue presented by myself and Steve Tyrrell (guest author). Power point on how my eco warrior novel, Rainforest Rescue was created. Writing workshops on Write a Rainforest Rescue story. I offer Free resources to schools from Queensland National Parks (my sponsor). Where do I present Rainforest Rescue School Visits? 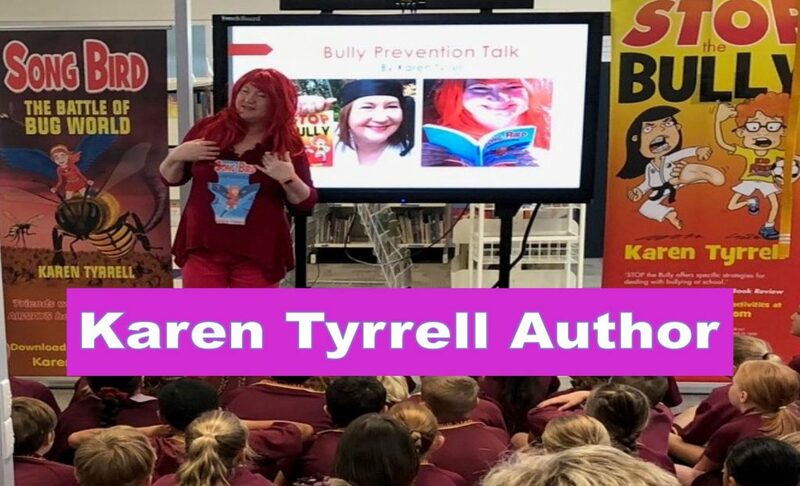 I’m available for school visits in Brisbane, Logan, Ipswich and Gold Coast. How do you book Rainforest Rescue School Visits? Great work, Karen. You offer schools a full program. 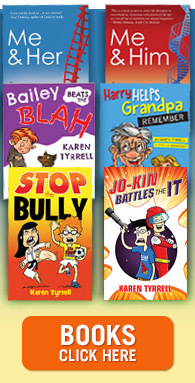 The teachers and students must love a visit from Karen Tyrrell, author. Its gives me SO much Joy!